The QAppointmentDelegate class provides drawing of QAppointmentModel items (QAppointments). By using QAppointmentDelegate, applications dealing with QAppointments can achieve a consistent look and feel. QAppointments are drawn with two sections per item. There are optional icons on the right side of the rendered item, and text on the left. The text and icons are rendered vertically centred within the item if there is enough space. The icons are rendered starting at the top right, in a top-to-bottom, right-to-left fashion. 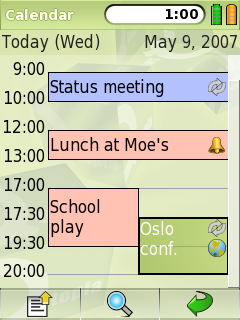 The following image illustrates a collection of QAppointments being displayed by an application. Qt::DisplayRole QString Plain unformatted text drawn on the left of the icon, wrapped to any icons. Selected appointments are rendered with the current palette's Highlight color), while unselected appointments are rendered with the Button color. See also QAppointment, QAppointmentModel, and Pim Library. Constructs a QAppointmentDelegate with the given parent.